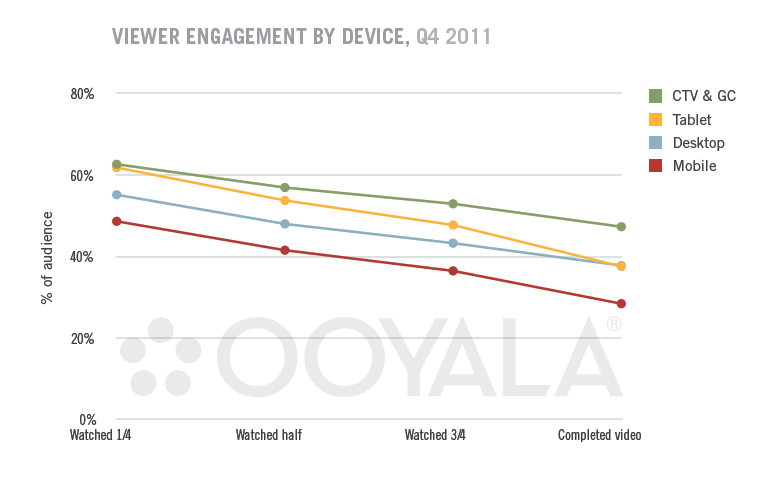 The number of videos viewed on tablets, mobile devices and internet-connected TVs nearly doubled in the fourth quarter of 2011, according to global analysis by online video platform Ooyala. The findings suggest that not only are viewers watching more online video, but the time spent watching also increased across all forms of access. Tablets grew the fastest between quarter three and quarter four, with time spent watching up by 22%, while mobile and desktop increased by around 15% and connected TVs by around 12%. In terms of engagement, connected TVs were the most likely to hold their audience til the end of the video (47% completed watching the video) and they also held audiences for longer periods of time, with clips of 10 minutes or longer accounting for more than half the hours watched. Tablet viewers, who completed videos 38% of the time, commanded the second most engaged audience and, while more videos were watched on mobile devices, viewers were less likely to watch videos through to the end on a smartphone. The findings show the potential of internet-enabled TVs to deliver an engaged audience to advertisers. According to the report, Google TV increased its share of video plays by 91% during the last quarter of 2011 across the markets in which it operates. But in Australia, uptake of online video viewing via internet-connected TVs lags behind overseas counterparts, with the vast majority of ”smart” television sets remaining unconnected to the internet. And, according to a report in the Sydney Morning Herald, only a small percentage of the 1.5 million sets that are connected are being used to access online video content, based on Telstra’s connection figures. Megan Brownlow, editor of PricewaterhouseCoopers’s Entertainment and Media Outlook, believes that for most Australians having too much choice and having to actively pursue content can be overbearing when it comes to watching TV. While connected TVs are not yet reaching their potential, the conversion rate (the ratio of video displays to video plays) of online video continues to grow overall, up from 35% in quarter three to 40% in quarter four of 2011. Facebook continues to beat Twitter in video sharing, at a rate of ten to one, with more than 10 videos shared on Facebook for every video shared via Twitter. Ooyala’s report also attributes the explosion in video plays on tablets and mobile devices in December to the “one-two punch of newly-gifted gadgets and time spent away from the office”. The data in Ooyala’s ‘Video Index Report’ was taken from a cross-section of Ooyala’s global customer and partner database – an array of broadcasters, studios, cable operators, print publications, online media companies and consumer brands in over 100 different countries.